Vail’s Lindsey Vonn, who blew out her right knee nearly a year ago in a crash at the World Championships, announced today she won’t be able to compete at the Winter Olympics next month in Sochi, Russia. Lindsey Vonn, shown here last month at Lake Louise, announced Tuesday that she will not be able to compete in the Sochi Winter Olympics (USSA photo). Vonn reinjured her surgically repaired knee in November while training at the U.S. Ski Team Speed Center in Copper Mountain but still managed to finish fifth in a World Cup super-G at Lake Louise, Canada, last month. But then she injured the knee again Dec. 21 in a World Cup at Val d’Isere, France, and later admitted she was skiing without an anterior cruciate ligament (ACL). Vonn, 29, has claimed the most all-time World Cup wins among American women (59) and is second on the career victory list behind Annemarie Moser-Proell’s 62. Vonn also won bronze in the super-G at the Vancouver Olympics and was looking to add to her medal total in Sochi. Vonn’s first knee surgery was performed in Vail by Dr. Williams Sterett of Vail-Summit Orthopedics. The World Championships are scheduled for February of 2015 on Beaver Creek’s new women’s Raptor course and the traditional men’s Birds of Prey course. Vonn was forced to skip the debut of Raptor over the Thanksgiving weekend because of her ongoing knee situation. Marolt said the U.S. squad will still be strong in Sochi, even without Vonn. Vonn is the only American woman who’s ever won the Olympic downhill — the signature alpine skiing event of the Winter Games — and only the third American overall behind Bill Johnson (1984) and Tommy Moe (1994). Mancuso, however, claimed silver in the event behind Vonn at the Vancouver Olympics in 2010. Sochi would have been the fourth Winter Olympic Games for Vonn, who turned in the best result for an American women at the 2002 Salt Lake Olympics with a sixth in the combined event, but Sochi may have been the last shot for Vonn to compete in the Games. She will be 33 at the 2018 Winter Games in PyeongChang, South Korea. 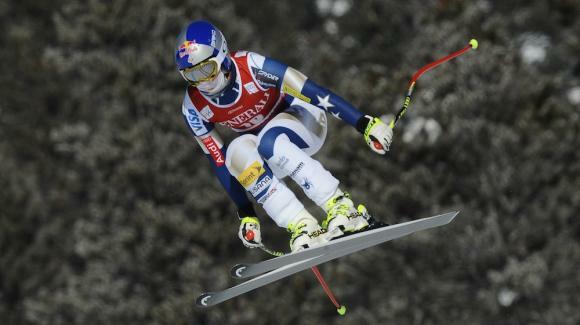 However, American Bode Miller is expected to compete in Sochi at the age of 36.